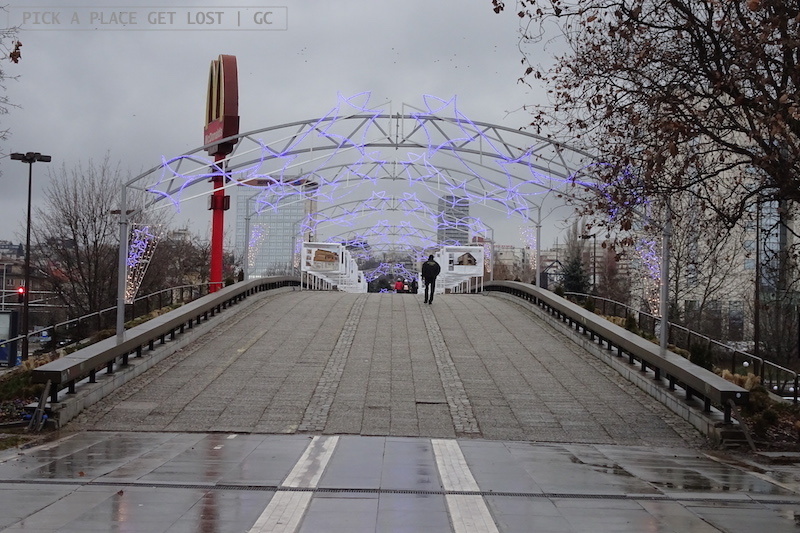 Sofia 2018 (3/3). 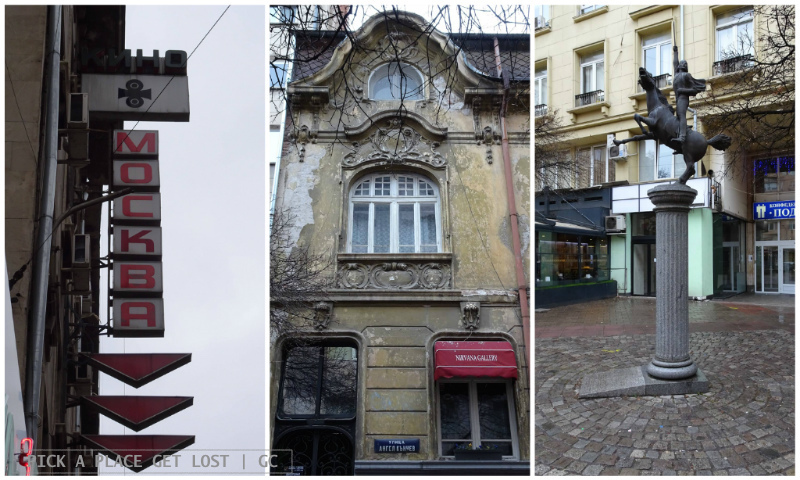 Sofia in one day: so where were we? Still in Sofia, obviously, and about to leave the Mineral Baths. 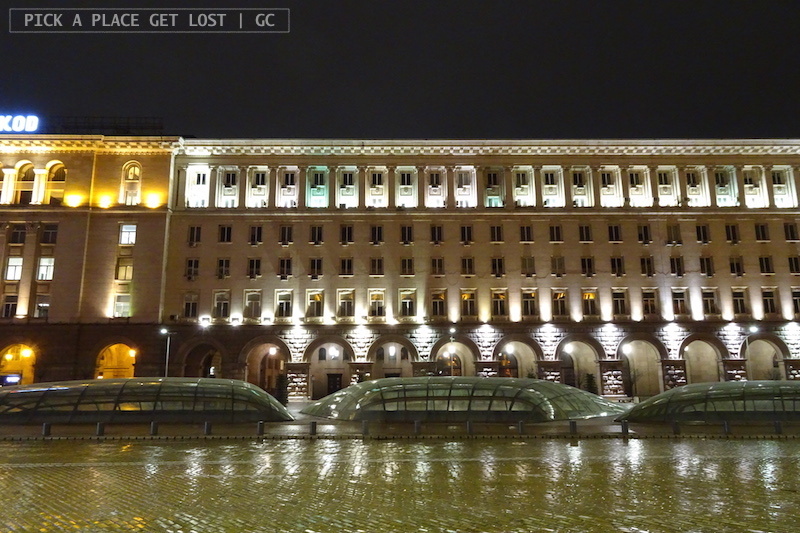 Okay, a bit further on, and you will reach The Largo (Ларго), a complex that includes three buildings: the Presidential Palace, the National Assembly and the TZUM shopping centre. The ensemble stands out in the urban landscape, for its architecture (it was built according to the principles of Socialist Classicism) as well as its key institutional function. The Presidential Palace is the austere-looking building with two guards always standing by the door. The National Assembly Building (Народно Събрание) is the vaguely triangular building overlooking the square, and is where the Bulgarian Communist Party (BGP) was formerly headquartered. The Shopping centre TZUM, or ‘Central Department Store’ (in Bulgarian ЦУМ, Централният универсален магазин) is the one that overlooks the Serdika ruins. It’s a place where you can find mostly expensive brands and pricey boutiques. The official name of the Largo is in fact Independence Square (Площад Независимост). 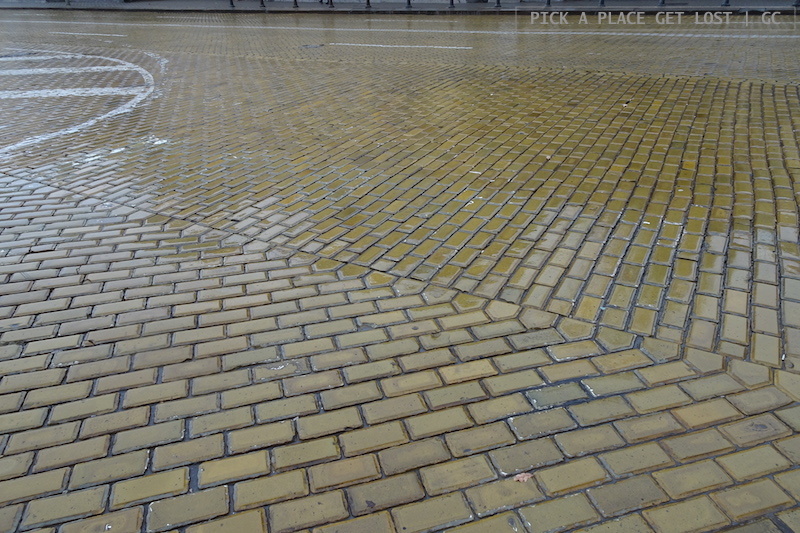 As you will notice, the square is paved in yellow cobblestones as are some of the streets in the area. The bricks were given to the city in the late 19th century when Prince Ferdinand of Bulgaria married Princess Marie Louise of Bourbon-Parma. Only in the early 20th century were they actually laid down. Rumour had it that they would be removed at some point. 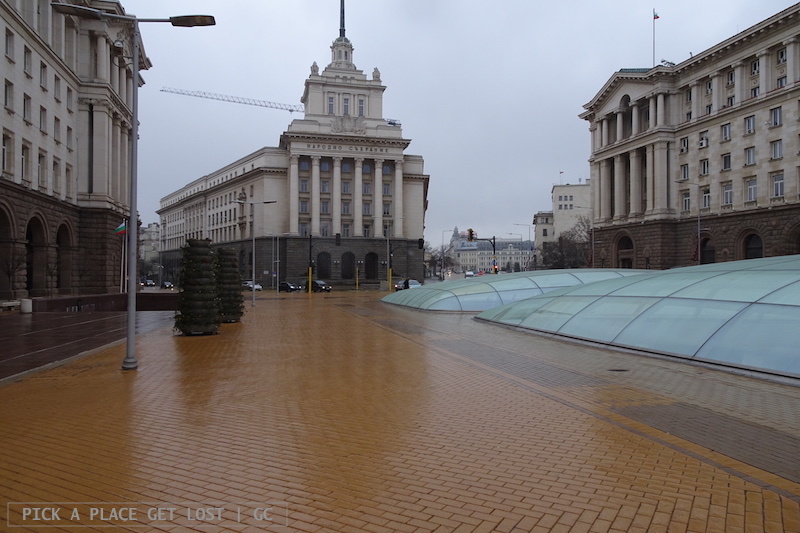 In fact, they are still there and there will remain: they identify the ‘downtown’ of Sofia, so, however slippery they get when it rains, they stay. If you ask me, they do look quite characteristic. What’s more, on Prince Alexander I Square (площад Княз Александър I) ‘yellow meets yellow’ where the colour of the cobblestones kind of matches that of the former royal palace, i.e. the imposing building that takes up almost entirely one side of the square and is now home to the National Art Gallery. 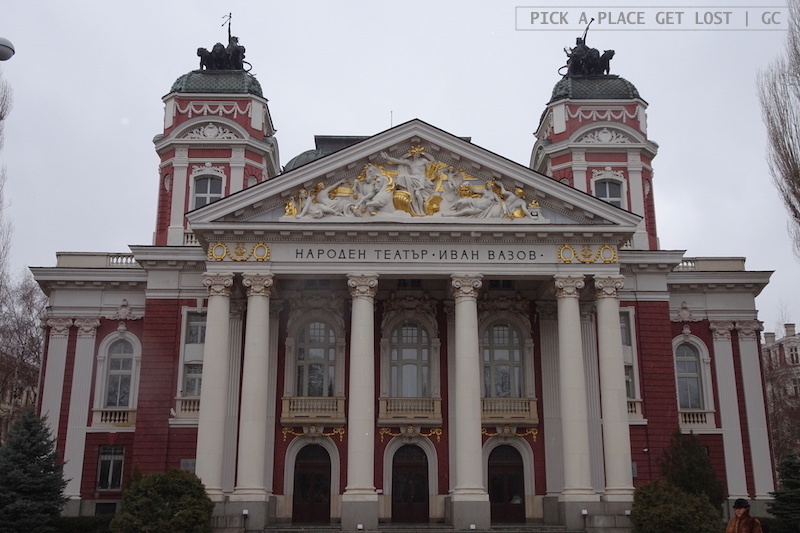 While you’re at or near the art gallery, you’re likely to also want to go have a look at the National Theatre Ivan Vazov (Народен театър “Иван Вазов”), Sofia’s oldest and probably most important theatre – certainly one in many theatres scattered all around the city. 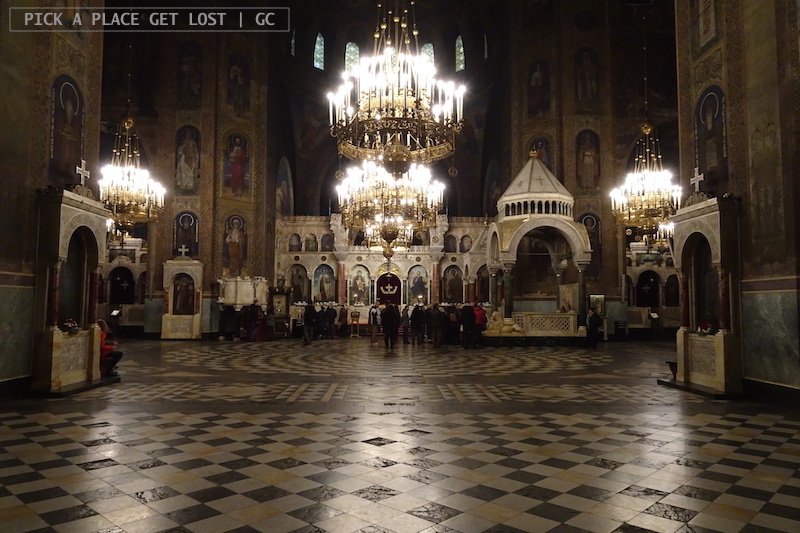 Since you’ve got that far, you might also want to go have a look at Saint Sofia Church (Света София). 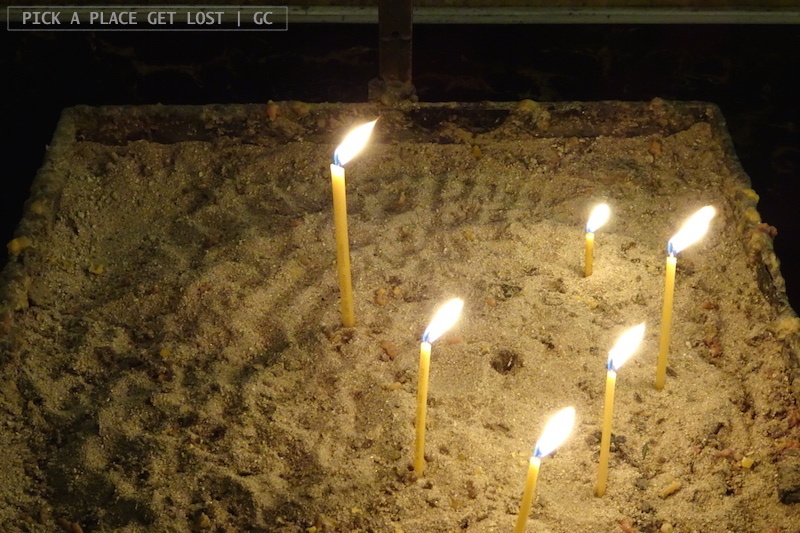 Walk down Georgi S. Rakovski St., past the Russian Church, and you will see it on your right. Saint Sofia is the second oldest church in the city, has a characteristic early-Christian cross design, and was originally part of Serdika. Take a closer look: the church does not have a bell tower. In fact, when the Ottomans took over, the church was turned into a mosque and minarets were added. Then, in the 19th century, two earthquakes partially destroyed it, and the project was abandoned. As part of the renovation that took place later on, the church bell was placed outside, on one of the trees in front of the façade. 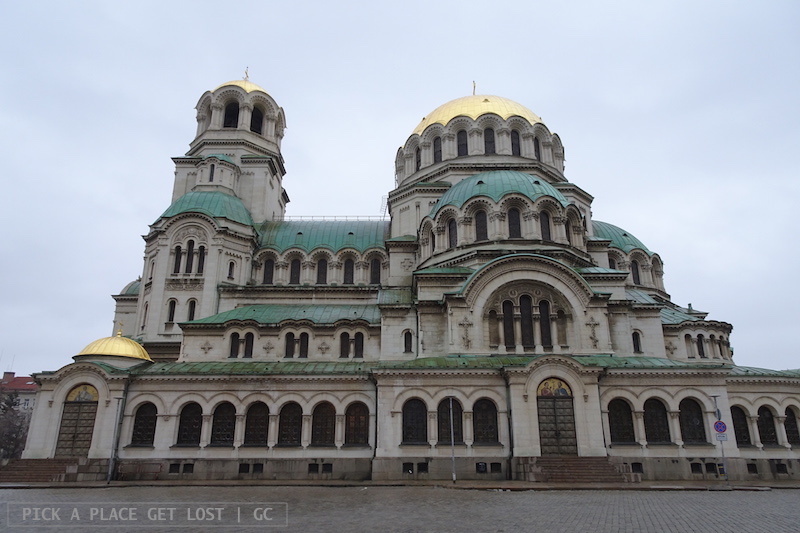 Your next stop is most likely to be the one and only Alexander Nevsky Cathedral (Свети Александър Невски). The project is relatively recent: it dates back to the late 19th century, when it was built to commemorate the Russian soldiers that fought the Russo-Turkish War, thus liberating Bulgaria from the Ottomans. Super popular, ‘mainstream’ landmarks are rarely my favourite, but with this cathedral I really have to say: wow. It’s stunningly beautiful and majestic, both outside and inside, where candles and chandeliers create the warmest atmosphere, and the three largest domes look like they’re partially blended into each other. 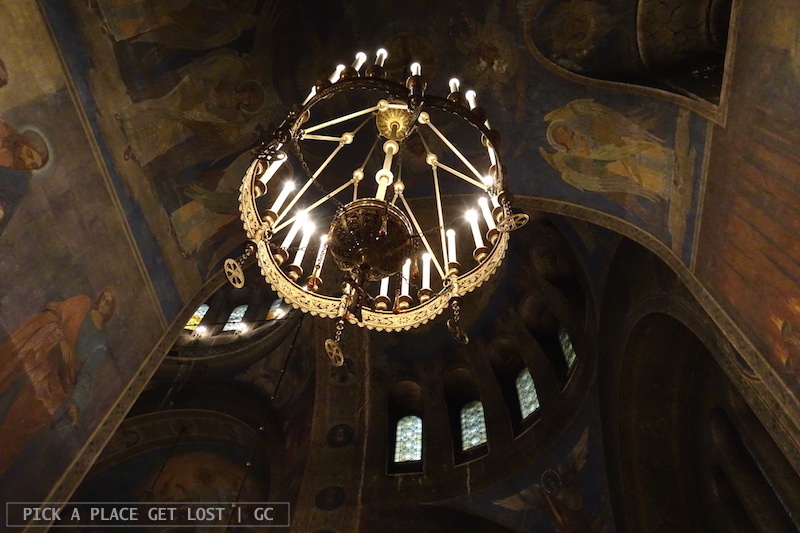 Useful bit of information: taking photos is strictly forbidden, but if you pay an extra ten Leva at the entrance (otherwise free of charge, as all/most Sofia churches), they give you a permit which allows you to take as many photos of the interiors as you like for up to two hours. If you want to try and take a few furtive shots, both in Saint Nedelya and in Alexander Nevsky without permit, do so ‘at your own risk’: the church keepers keep a constant eye on the visitors to make sure no unauthorised photos are taken, men remove their hats when entering the church and, more in general, everybody complies with the basic visiting rules in general. While Alexander Nevsky Cathedral is Sofia’s top-list and most popular landmark, its ‘secular’ counterpart is probably the Palace of National Culture, or NDK (Национален дворец на културата, or НДК in Bulgarian). It’s a multifunctional conference and exhibition centre opened in 1981 to celebrate the city’s 1300th birthday. The complex is also home to a few cool, interesting bars – namely, Memento and Club Peroto. 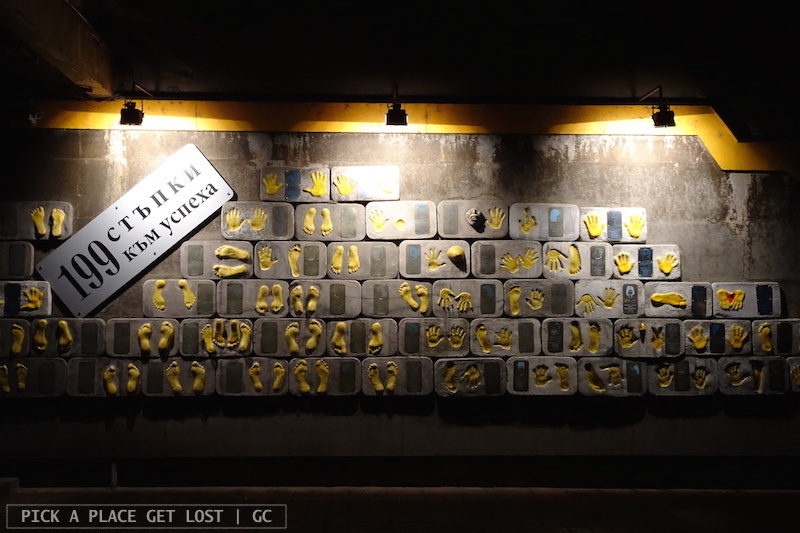 Regardless of whether you have time to visit them, though, you will certainly want to take a photo of the staircase that leads up to Club Peroto. 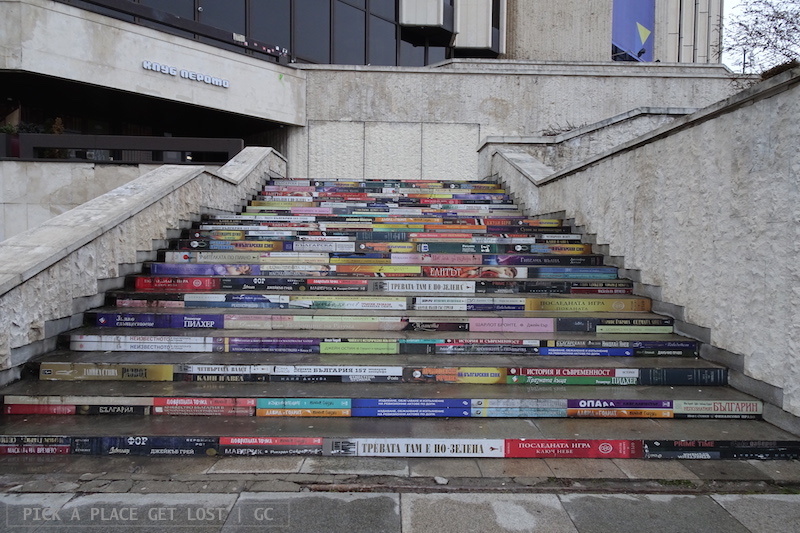 Being the bar a literary café, what could the staircase look like if not a pile of books? It’s objectively super cool. 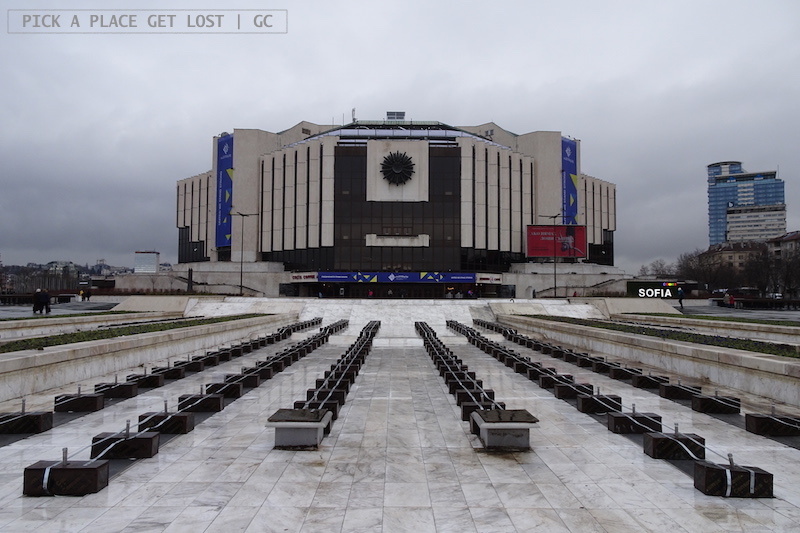 There is obviously a lot more to Sofia than the relatively few places I’ve mentioned in this post. Like the university building, Rakovski St. (aka ‘Bulgarian Broadway’ because of its many theatres), churches I couldn’t tick off my list, parks I didn’t have the time to visit, bridges I wasn’t able to cross, Vitosha mountain (!! ), and much more. So really, I could only stick to places and sights I have seen and/or visited in first person. 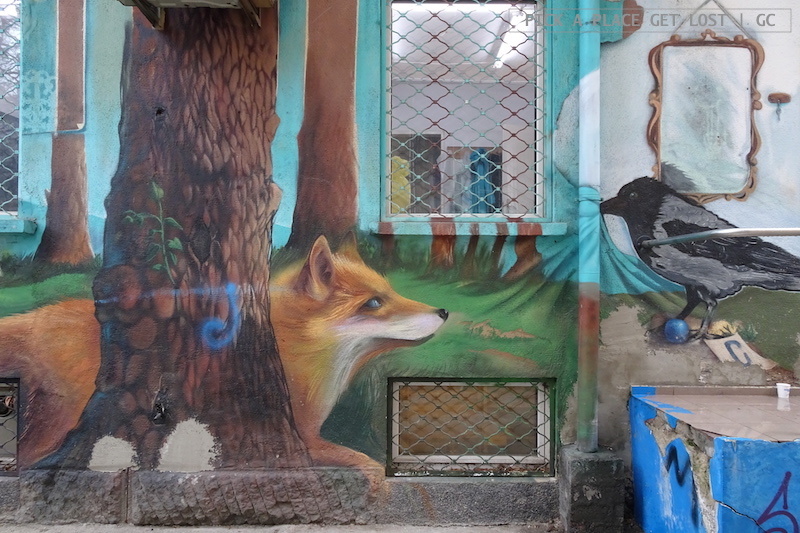 There is, though, one last thing I’m keen to mention, and it’s this: keep an eye out for cool street art in Sofia. It’s virtually everywhere, and you don’t want to miss it. Trust me on that. As I have repeatedly mentioned, I haven’t seen but a small portion of Sofia, so any final statement or remark is also to be taken as uber subjective and partial. 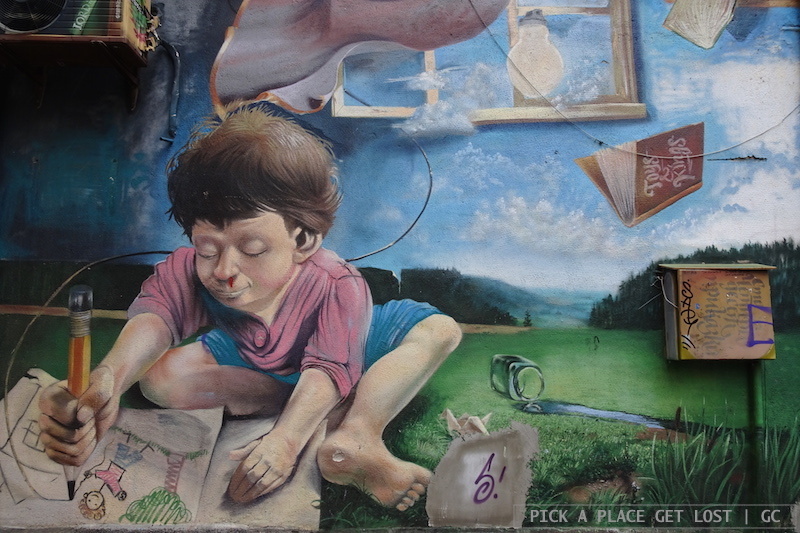 I can say for sure one thing struck me a lot about the city, and it’s the exceptionally multi-faceted identity it belies – which obviously also means contradictory. It does have its negative sides to it, but also reveals a super rich cultural background. On the one hand, the contradictions are right before your eyes the whole time. 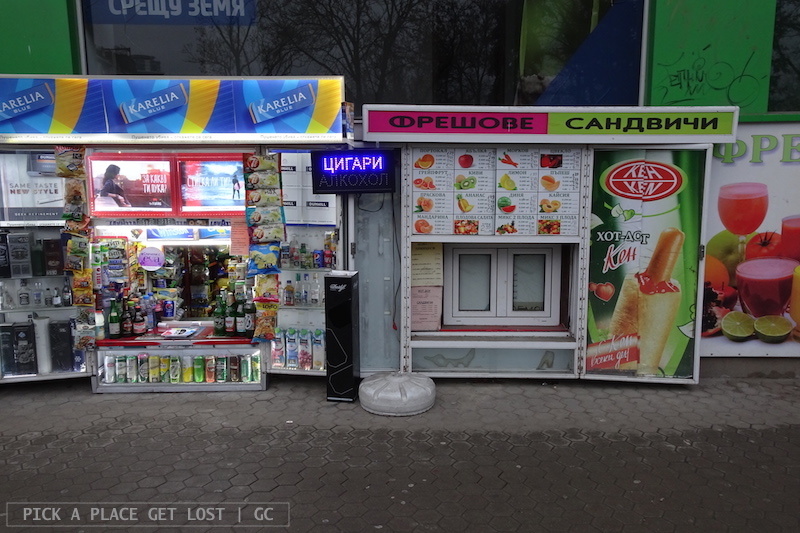 You have fancy brands and stylish boutiques on one side of Vitosha St., but take a closer look, and you will see homeless, beggars, stray cats and dogs here and there both at street level and underground. I mean, it’s a large city, no surprises here. The four churches (alongside other buildings, sites and areas) also act like a summary of key periods in the city’s history: the Romans, the Ottomans, the Jewish population (partly) spared deportation in the early 1940s, and the Soviet influence, which might contribute to explaining why matrioshki are (still) displayed in stall windows near the underground. 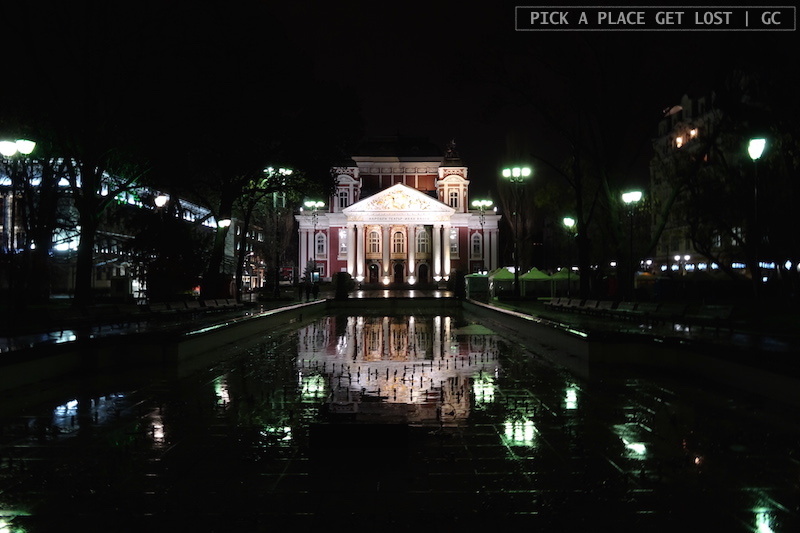 Plus, as I wandered the streets of Sofia, I couldn’t help thinking how beautiful it is at night. If you stroll down side streets here and there, and eventually step out onto a large boulevard, keep your head up along the way and take in all the majestic, imposing buildings lined up on its sides. Those, with the silence and the darkness, make for the perfect night walk home. If you go to Paris, London or Rome, you might find it quite easy to see and recognise the ‘typically’ French, British or Italian. If you go to Sofia (as with other, less ‘mainstream’ capital cities), it might be that nothing in particular strikes you as ‘strictly Bulgarian’. There are virtually only a few actual landmarks more popular than most. 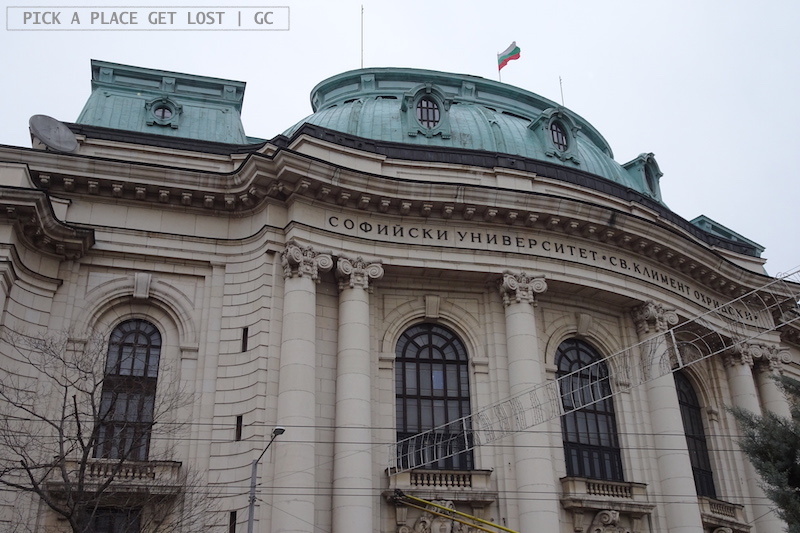 Those, however, can’t possibly be enough to set the standard of what could rightfully be called ‘typically’ Bulgarian – which might lead the one-time tourist to not realise where Sofia’s urban identity lies. Except, maybe Sofia’s actual urban identity is right there before the eyes of the visitor from the very start. However, the fact that it lies in the very blend of historical and cultural layers Sofia is built on makes it hard to give the city a standard, universal label. But then, maybe that is the whole point. 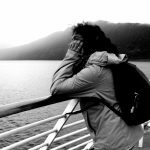 This entry was posted in Sofia 2018 and tagged bulgaria, sightseeing sofia, sofia, weekend in sofia, what to see in sofia by Giorgia. Bookmark the permalink.